Christmas Memories Past And Present #05. > Listener feedback from Chris K.
> Share your Christmas Memories, from the past and/or present by calling (206) 984-1446 or leave them in the Comments section here. Thank you. 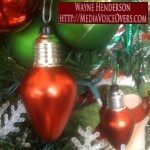 Please click here to leave an iTunes review for the Christmas Memories Past And Present podcast.